Filmmaker Seth Breedlove addresses the audience prior to a screening of “The Mothman of Point Pleasant” in 2017, held at the Lowe Hotel in Point Pleasant. The director of “The Mothman of Point Pleasant: 13 Months that Changed History,” is developing a new, documentary mini-series that takes on the Bigfoot phenomena. Director Seth Breedlove grew up in Bolivar, Ohio and used his hometown as a central location in the project, which, in addition to Northeast, Ohio, was also shot in California, Oregon, Washington, Oklahoma, South Carolina, New York and more. While filming “On the Trail of Bigfoot,” Breedlove joined four different Bigfoot investigative groups located in Southern Ohio, Pennsylvania, the Olympic Peninsula in Washington and the Ouachita Mountains in Southeastern Oklahoma. The series tracks the history of the Bigfoot subject while also telling Breedlove’s personal story, tracing how he went from ardent skeptic, to truly believing there could be a real, undiscovered creature lurking in North American forests. The documentary mini-series was created by Breedlove as a “solo, filmmaking experiment” through the course of 2018. Shot in over 14 different states, and featuring 21 Bigfoot enthusiasts, investigators, skeptics and believers, “On the Trail of Bigfoot,” is told in six episodes. Breedlove drew national attention in 2015 with the release of his first film, “Minerva Monster” which documented a Stark County, Ohio family’s brief-but-terrifying encounter with a mysterious being in the woods behind their home in the late 70’s. “On the Trail of Bigfoot” revisits the “Minerva Monster” story within the context of retelling the entire history of the subject. Since the release of “Minerva Monster,” Breedlove has gone on to direct numerous features and shorts focused on local legends and lore. In 2018 he began developing an original series based around his films with a production company in Hollywood. He spent numerous days and nights in the forest with these groups searching for the creature and managed to get some intriguing video and audio evidence that is shown in the mini-series. While in the Ouachita Mountains, Breedlove and members of his team witnessed something throwing rocks and making bizarre screams from a hill near their camp; an event that persuaded Breedlove that perhaps there is more to the Bigfoot “legend,” after all. “On the Trail of Bigfoot” was shot, edited, written, narrated and directed by Breedlove who considered the task of solely creating the series as a “filmmaking challenge.” He also co-produced the series with his wife, Adrienne. Together they run the production company, Small Town Monsters based out of Wadsworth, Ohio. “On the Trail of Bigfoot” will premiere at the Canton Palace Theatre on Friday, March 29 at 8 p.m. with four of the six episodes being shown. It is also scheduled to play at a film festival in Eau Claire, Wisc., and again at the Kent Stage in Kent, Ohio this coming April. The series will see a digital premier on Amazon, Vimeo OnDemand and VIDI Space as well as DVD on March 29. 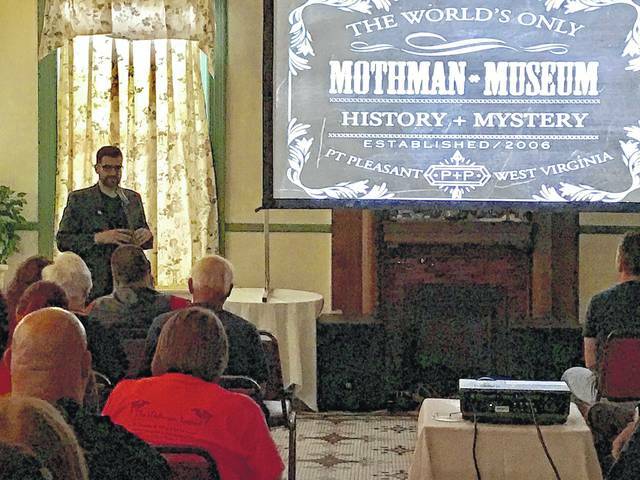 Breedlove’s film, “The Mothman of Point Pleasant: 13 Months that Changed History,” was shot in Mason County with the world premiere in Point Pleasant in 2017. Breedlove and the Small Town Monsters crew have also visited Point Pleasant and the annual Mothman Festival. The festival has embraced Bigfoot enthusiasts in the last several years, as well as those fascinated with the legend of Mothman.